Whooper Swan is a large, migratory birds. It is considered to be the most elegant one in the swan family. Its common name refers to the loud “whooping” calls it makes. Earlier the Whooper Swan was called Elk. Find out here how this elegant swan looks. 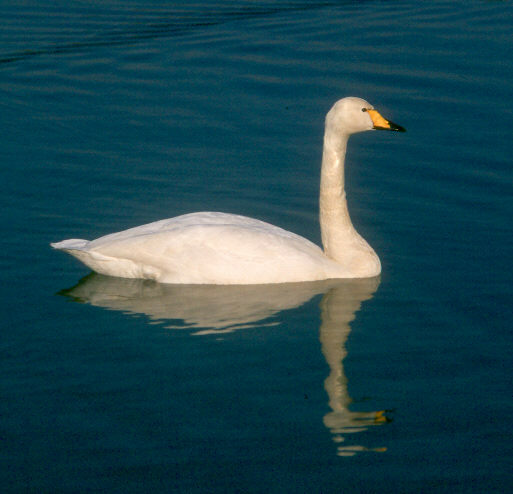 Size: Length of Whooper Swan varies within 140-165 cms. Weight: This swan’s weight ranges between 7.4- 14 kgs. The males weigh between 9.8 and 11 kgs. The females weigh around 8.2-9.2 kgs. Color: It is white in color. Its black bill has a large triangular patch of yellow. Its legs are black. The Juveniles have greyish brown plumage and their bills come in a color combination of pink with black. The eyes are dark brown in color. Wingspan: The wingspan of Whooper Swan is 205-235 cms. Shape: They have broad and flattened bill, waterproof feathers and webbed feet. They are usually found in Scotland, Northern Ireland, Northern England, parts of East Anglia, Wales and Russia. They are mostly found in freshwater wetlands and ponds. 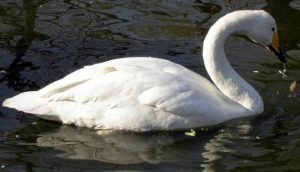 Many swans also live near the coasts and quiet rivers. They also inhabit farmland, flooded grassland and estuaries. They spend the winters in low and open farmland. They are migratory birds and migrate a long distances to breed. They swim with upright neck and they never raise their wings. They spend much of their time swimming. Apart their breeding season these birds are highly sociable. They fly in large “V” formations. The Whooper Swan has deep vocal bugling calls. Their calls at times resemble old fashioned car horn. 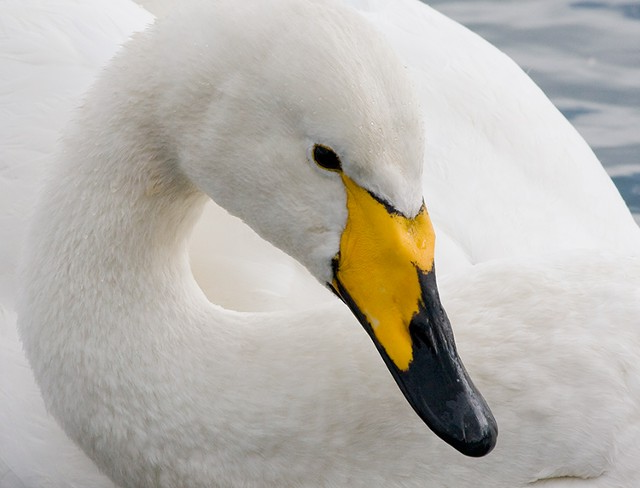 The Whooper Swan makes “whoop-whoop” calls which resembles trumpet. This species of swan usually feeds on aquatic plants, grass, grain, sugar-beet and potatoes. Despite their heavy body they are powerful fliers. They fly silently. New born cygnets are mainly lost to herons, turtles, pike and large perch. Adults do not have many predators due to their habitat condition, but sometimes when other large aquatic creatures invade their comfort habitats then they fall preys to those predators. This huge and amazing swan has the following adaptive features. The young Whooper Swans need large areas of water to live in because their body weight cannot be supported by legs for a long period of time. Their huge size is their best defensive feature against most possible predators. 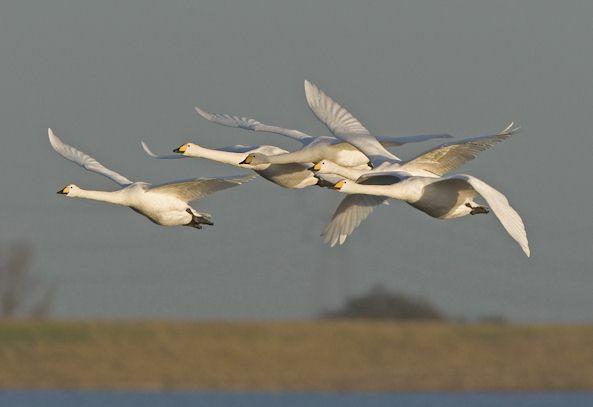 The Whooper Swans breeds from mid may in well demarcated areas. They prefer to breed in wetland areas. 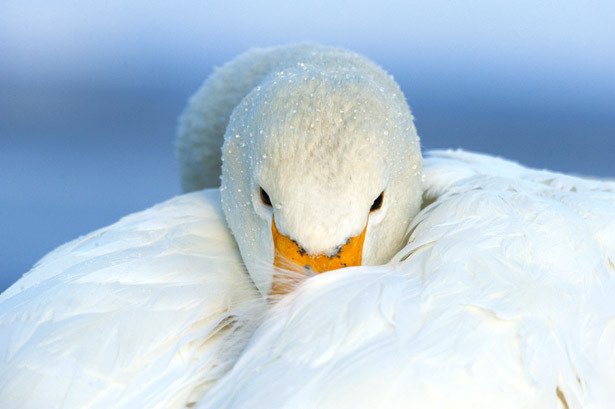 The Whooper Swan reaches its sexual maturity at the age of 4 years. The Whooper Swan lives in pairs for life. The mates perform courtship displays with male and female facing each other with half opened wings. Each bird alternatively ends and extends the neck accompanied with loud trumpeting calls. Males are very active in building nests. The males protect the territories during the nesting period. The female lays 4-7 eggs and sits in it. The gestation period lasts for 5-6 weeks. The parents moult after breeding and leave the place in flocks or small family. Adults remain flightless for about 30 days after breeding. The cygnets can fly only after 120 days since birth. Both the parents take care of the cygnets. The Whooper Swan lives approximately up to 26 years. 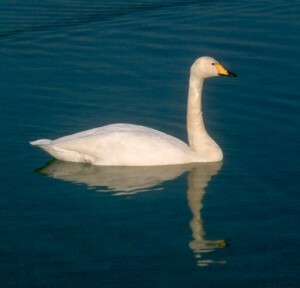 Whooper Swans are listed in the category of “least concern” by the IUCN. Find out some very interesting facts about this wonderful and elegant swan species. Their wings make a musical sound, when they fly. Whooper Swans features in Irish Myth and Legends. Here are some images of Whooper Swan.